Each capsule contains a standardized 50:1 extract of the herb Polypodium leucotomos 120 mg, and 280 mg of the rhizome. Polypodium leucotomos is a fern native to Honduras. It contains no fillers or excipients. The ancient Mayans used Polypodium leucotomos (Kalwalla) as part of their daily diet in the form of tea as a blood purifier. They attributed healing properties to the drink and up until today the drink is still popular in Honduran tradition. 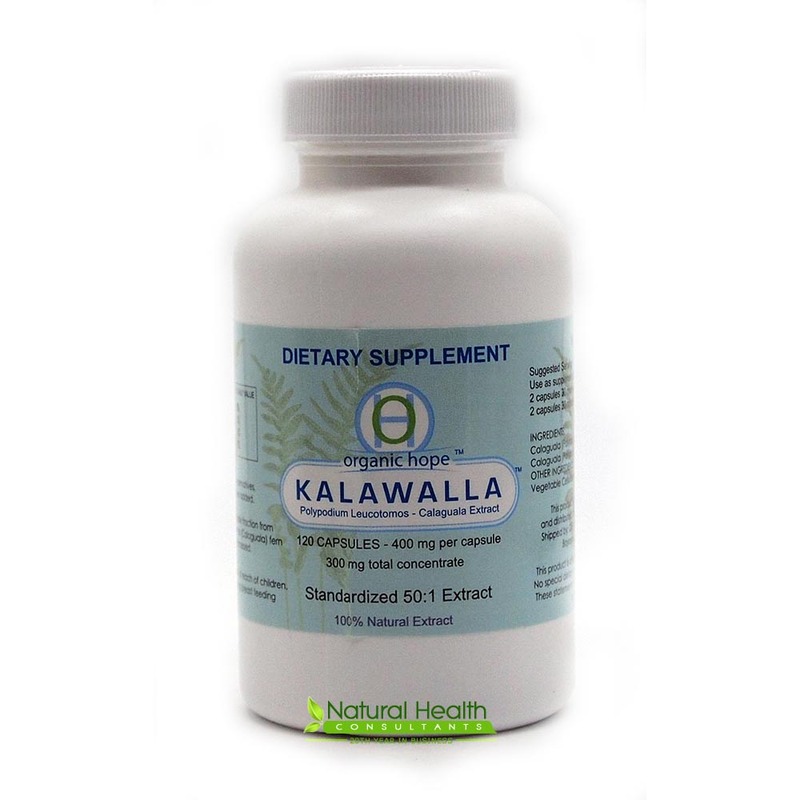 Kalawalla is used to support skin health. The manufacturer has a money back guarantee (minus shipping and handling) if the product is used for 12 weeks straight without results. Furthermore, it must be taken according to the proper directions and the empty bottles must be returned. .
Do not use if pregnant or nursing. Keep out of the reach of children. No toxicity or side effects have been noted. It has been used in Europe for 10 years with no problems. This herb has been known to potentiate the effect of digitalis extract and any of its derivatives such as digitoxin and digoxin used to treat heart failure. Some common trade names for these products are Crystodigin, Lanoxicaps and lanoxin. If you are taking any of these products you should not take Polypodium leucotomos extract. There are no other known drug interactions. Take at least 30 minutes before or after consuming milk or antacids. Take 2 capsules 30 minutes before breakfast and 1 capsule 30 minutes before supper. Use daily. Kalawalla may take anywhere from 4-8 weeks to notice satisfactory results in case of Psoriasis and Dermatitis while it may take anywhere from 3-6 months in cases of Vitiligo. The saying in Siberia is that "anyone who drinks Rosavin tea will live to be over 100." People using this product say that it eases the pain quickly and stops the infection in 30 to 36 hours. A great source of natural levodopa. Support for mammary and lymphatic health.